Multi-interface serial gateway for RS-485, RS-232, UART, and I/O. 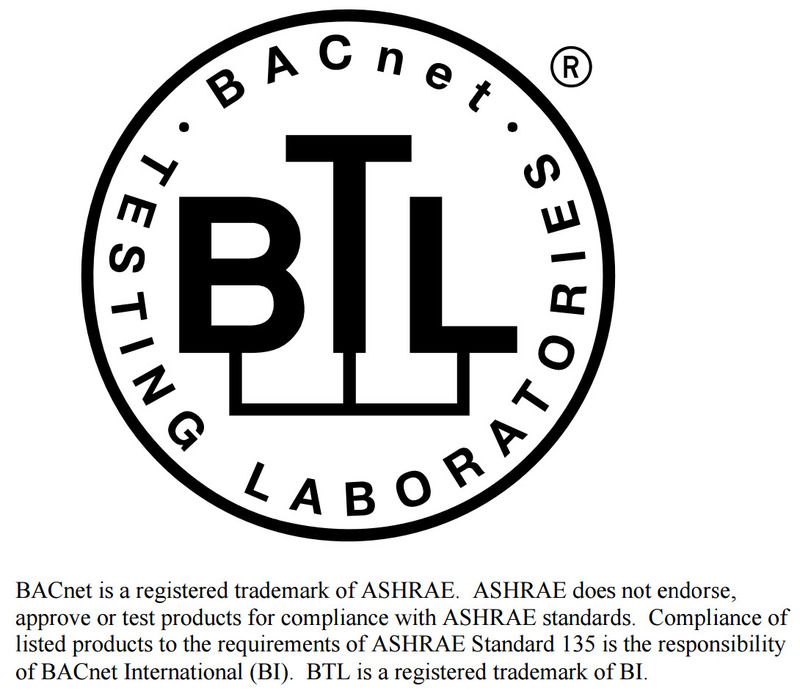 Modbus RTU, BACnet MS/TP, Metasys N2, Siemens FLN, DMX-512, Generic Serial, and more. Features galvanic isolation, 9-24V AC/DC power support, and over 3.5 times more object memory compared to our XLTR-1000 gateway. The Mirius is a flexible, multi-interface gateway capable of bridging various popular industrial and commercial serial communication networks. The gateway also features analog and digital I/O to easily network-enable sensors, meters, and other hard-wired equipment. The dedicated RS-485 network port can be configured for multiple protocols which can be selected at run-time. The multi-interface port includes two dedicated I/O terminals and is jumper-selectable for RS-485, RS-232, UART, or I/O. Each port is galvanically isolated from the other and from the power supply. 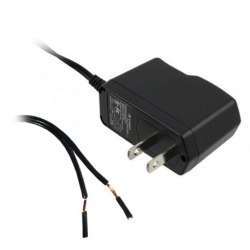 The Mirius accepts 9-24V AC/DC power and can also be powered directly from a USB connection. 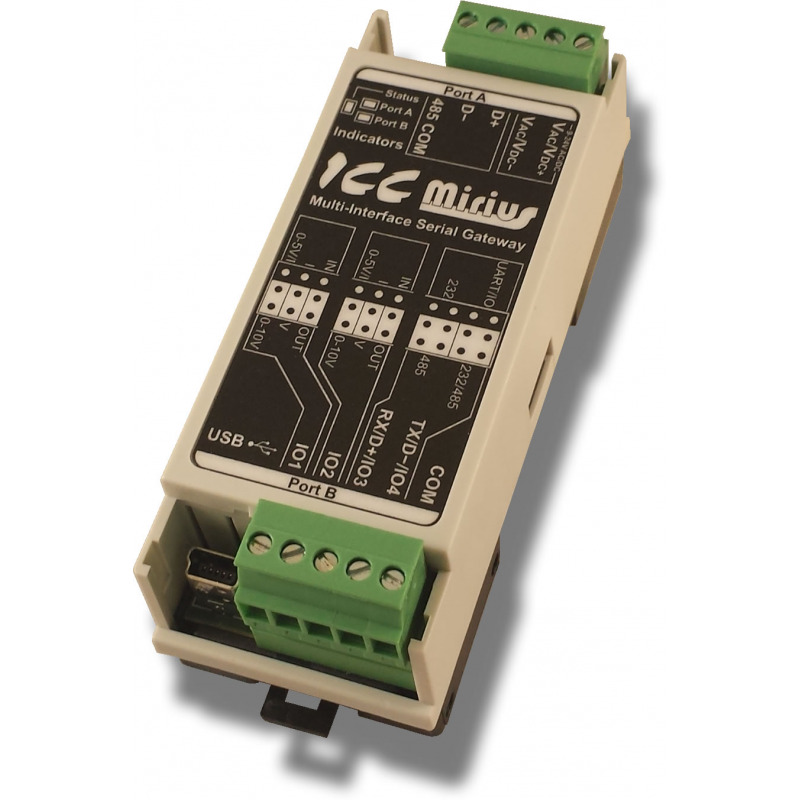 Using the Mirius, serial communication and/or I/O signal data can be converted to a serial network protocol (such as Modbus RTU or BACnet MS/TP), providing seamless data exchange. PLC-style logical, arithmetic and filtering data manipulation operations, called Database Logic, allow the construction of complex autonomous data conditioning and control functions. Configurable network timeout action can also be programmed to allow each database address its own unique "fail-safe" condition in the event of a network interruption. In addition, persistent user parameters located in the device's internal database are available for calibration data, serial numbers, device IDs, etc. that persist across reboots and power cycles. The gateway also supports a versatile Generic Serial communication driver which allows integration with any serial device including proprietary or custom protocols using ASCII and/or binary encoding formats. The Mirius is field configurable and upgradable. Configuration is performed via USB using the Windows-based ICC Configuration Studio for any of the supported and proven serial protocols. To ease installation, the configuration of the Mirius can optionally be split into two parts, one performed by the OEM or integrator, and the other by the end-user or installer. The OEM/integrator uses the ICC Configuration Studio to create a configuration for the gateway consisting of protocol objects mapped into the gateway’s internal database for each protocol the OEM/integrator would like to support. 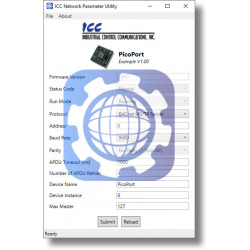 The end-user/installer can then use the light-weight Network Parameter Utility to select the proper network configuration settings for their network, such as protocol, address, baud rate, parity, etc. and submit these settings to the device via USB. These dynamic, run-time network parameters can also be set directly via communications to achieve a more fully integrated user experience. The Mirius comes with lifetime free firmware updates including any new protocol drivers developed in the future. And of course all ICC hardware products include free unlimited technical support.